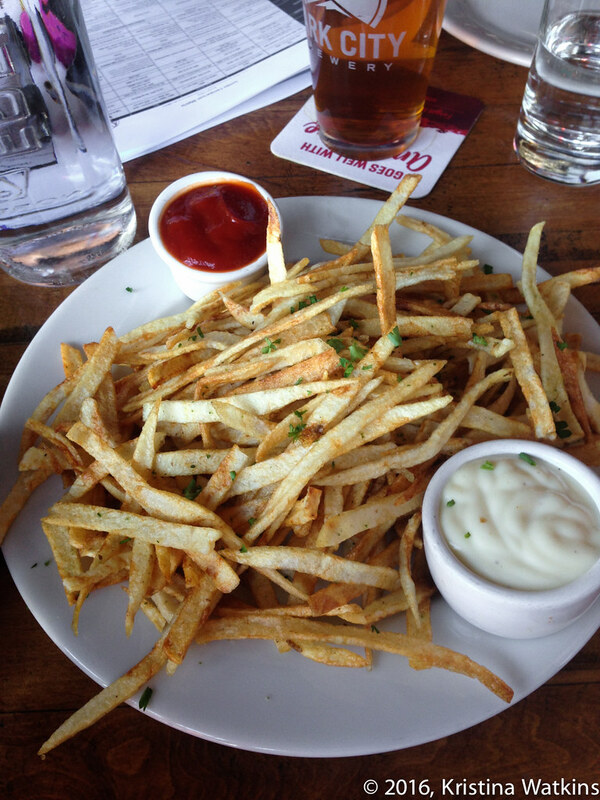 I got these spuds at the Boneyard, which is a very popular bar/wine bar/restaurant. Or something. 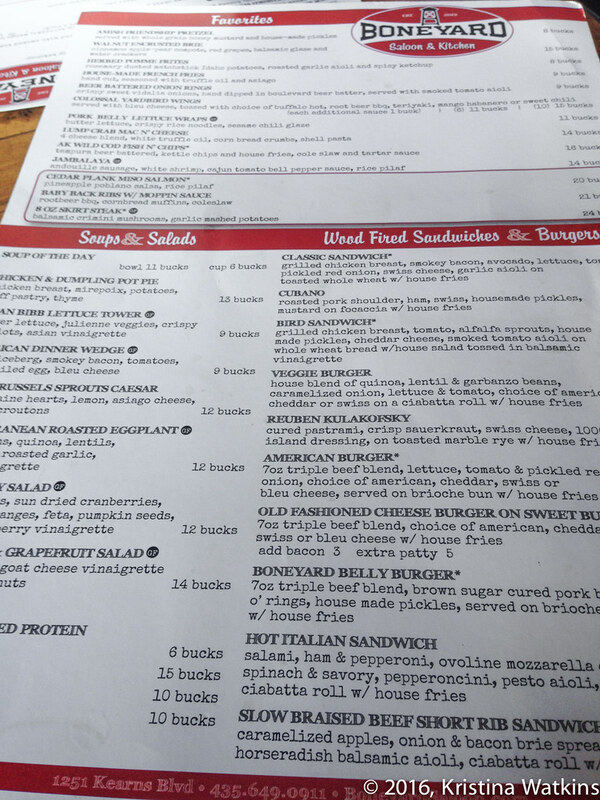 There are two different menus and like four different dining areas and it’s all very confusing and I like to meet people there and arrive late so they can tell me where the hell to sit. But it is extremely cool inside. There are a thousand and one photo ops. This is one of the bars. 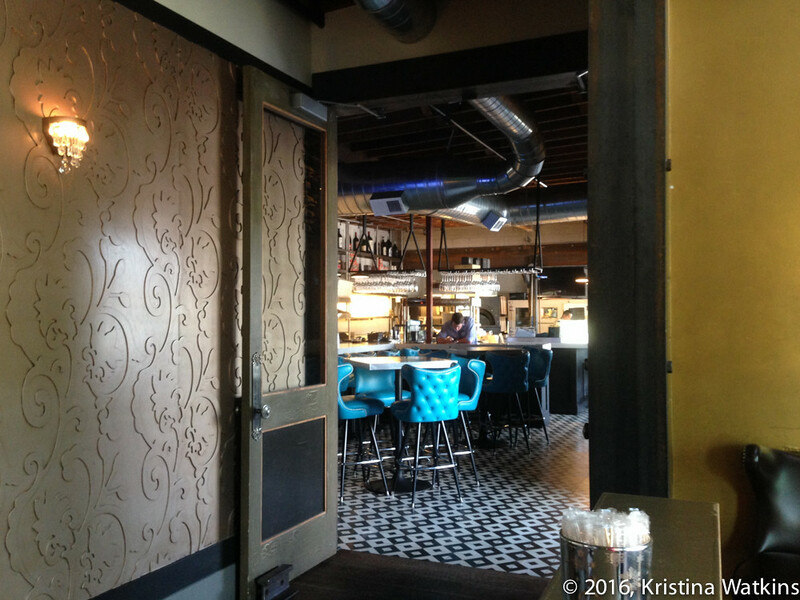 I approve of the brick, exposed ductwork, the periscope cupholder thing at the bar bar, and those studded chairs. Lovely and comfortable. 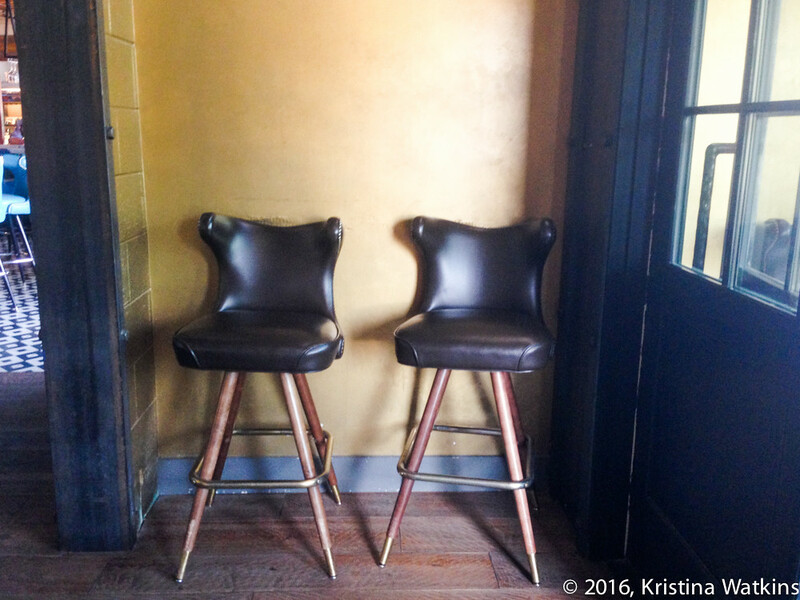 Dear saloon owners: barstools need to be comfortable. If they are not, people will not linger and order more overpriced cocktails. And here is another bar. The wine bar maybe? It’s a little less busy than whatever other bar I was in but those turquoise chairs and black and white checkered floor just slay me. 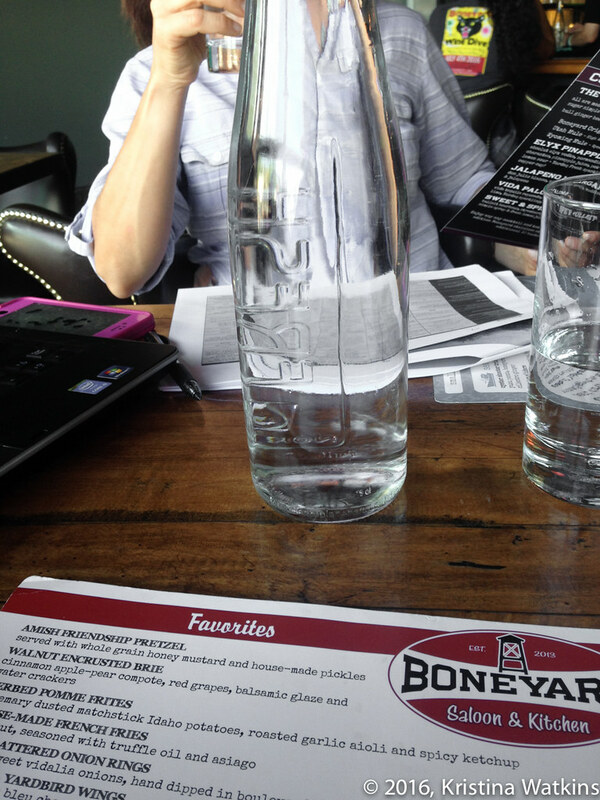 The menu I think we ordered off of is a bit more uppity than the gastropub concept of the twenty-aughts. Yes there is a cheese dip but it’s walnut encrusted baked brie. Yes they have a Caesar salad but it has brussels sprouts in it. They brew their own iced tea, which is nice. And they served me fake sugar and Sugar in the Raw, which is less nice. Sugar in the Raw is delicious and crunchy sprinkled on sugar cookies or mixed into hot coffee. But in a cold drink you may as well just throw gravel into your cup and pretend it tastes sweet. Though I stirred my iced tea five thousand times much to the dismay of my table-mates, drinking it was bitter bitter bitter bitter gritty sweet. P.S. 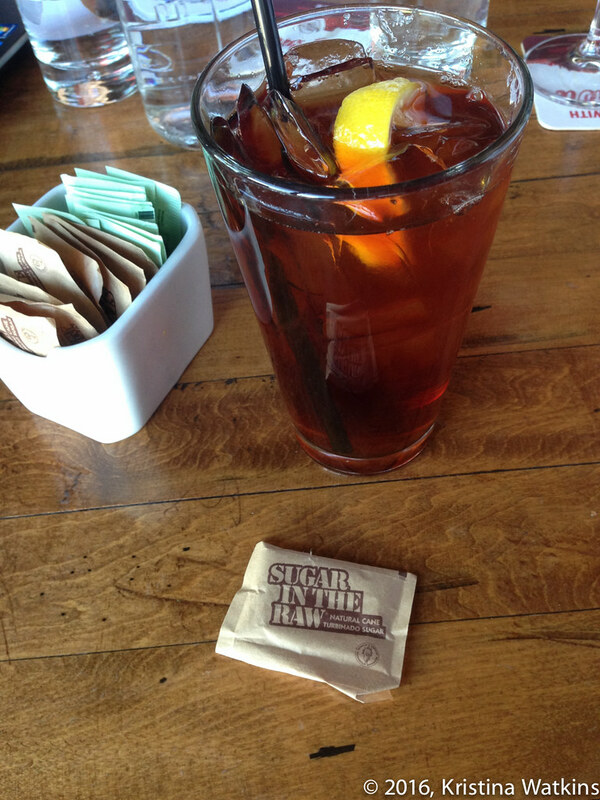 Saloon operators: if you serve iced tea you also need to serve finer-ground sugar. 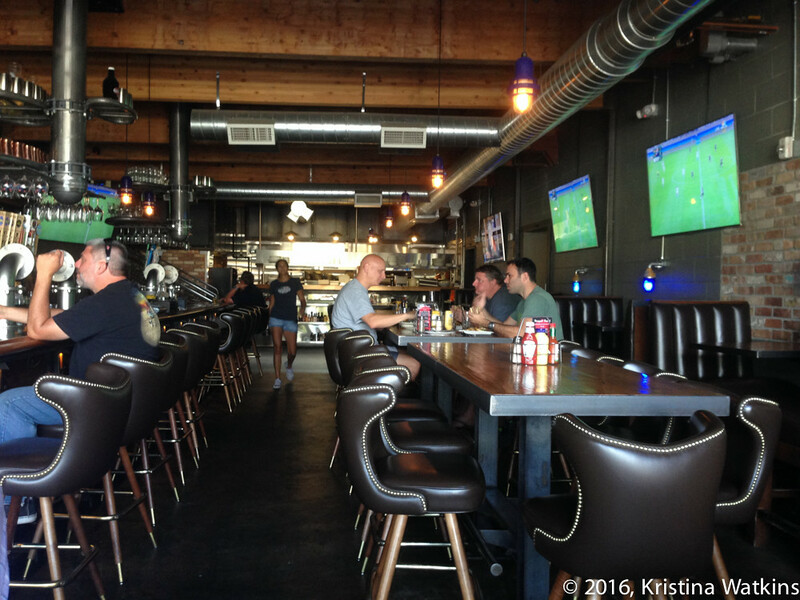 But it is a light, fun place to have a beverage with other adults or to blow off steam after work. There are TVs with Sports! but it’s not overwhelming. Nor is the music or overall sound level. You can come have a good time, have a conversation and leave without feeling like you need to take a shower when you get home. The fries are perfect, but a little difficult to get. 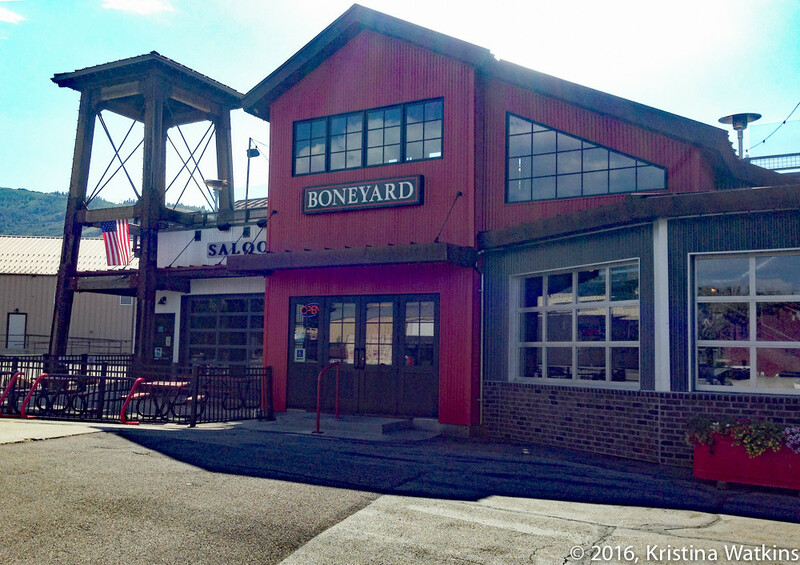 The Boneyard sells “herbed pomme frites” which are dusted with rosemary. They also sell “house-made french fries” with truffle oil and asiago. You have to ask for PLAIN DAMN FRIES. Considering the dipping sauces, I think these ended up as the Herbed Pomme Frites without the Herbed. Just be super clear, all you want are plain french fries: potatoes cut up, fried until brown, and salted. AND YOU WILL BE REWARDED. These are fantastic. They are exactly the same as if you cut them up at home and fried them yourself but without all the grease in the air. Delicious. Go just for a plate of these. Go for two. Two plates of plain fries and a beer please and maybe my companions are here somewhere but I can’t find them and well, they can order their own. Whatever you’re doing, keep it simple. And do it better than everybody else.